Objective: Our little bunny needs your help to destroy all the eggs using bombs and other powers. If you are a match 3 type fan, this will be your perfect game where you have to tap on more than 3 look-alike eggs to destroy them. If you tap a 4-egg group, you will gain some powers like big or small bombs, line destroyers, and color destroyers. If you will need to buy some powers, you can use our in-game shop! Let's see how many levels you can finish and what score you will have! 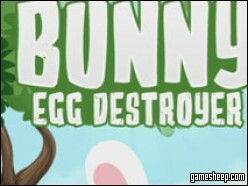 We are glad that you have chosen to play Bunny Egg Destroyer on GameSheep.com, the most dynamic website available. If you like this game Bunny Egg Destroyer don't forget to rate it and this way you will help with selecting only the best games for the home page.